Well here we go, the Red Insure Cup. It’s proving very difficult to contain the overwhelming exhilaration that is raging through the PRATS who once again are on the road. Mrs Fuggles protested, surely you can’t be away again? “Sadly my dearest, not only are we away tonight but also next Friday night”, 5 away trips in 18 days, 4 night games and one Saturday games with the monster trip coming up the weekend after next, down to Bideford. 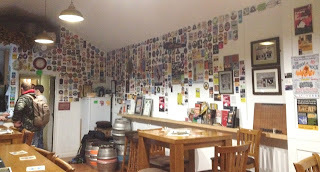 Nevertheless, Lady Fuggles conveyed me and Citra to our usual pick up point, The Britannia in Northampton, but this time we thought soddit, we ain’t going to have another Tribute so we didn’t go in. Parker arrived just after 4.00pm and we made our way to Stratford. We went straight there and arrived in the car park opposite the Stratford Alehouse around 5:30pm, a crawl on the M1 had slowed down our journey. Just 4 ales on today, RCH brewery Old Slug Porter, Prescott brewery Grand Prix, Stratford Upon Avon Brewery Malty Pig and Wye Valley HPA, all served by gravity. Citra and I went for the HPA, a pale ale at 4.0%, it was pleasant enough, refreshing but not a great deal of flavour. It was perfectly clear with a good head which clung to the glass all the way down. Parker tried the local ale Malty Pig, it looked in very good condition, dark amber coming in at 4.4%. In fact it looked so good I went for it next whilst Citra stayed on the HPA. The Malty Pig was quite malty indeed but also packed with a delightful bitterness, this ale had loads of flavour with a pleasant lingering aftertaste. It’s not the sort of ale I would normally go for but I’m glad I did, well worth it. 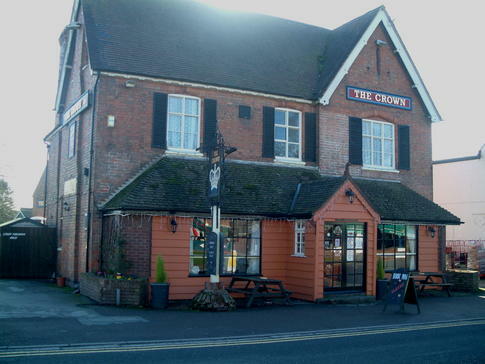 We then moved onto the Crown Inn at Tiddington just a few hundred yards away from the Stratford ground. 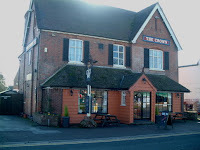 Nice pub, looked as though it had been recently refurbished with the obligatory pastel shades of grey and duck egg blue. You name it, it had been given a coat of paint. Still the pub felt clean and fresh. Food sales would be a dominant part of the trade. The cask Marque sign on the door raised our hopes of a decent pint and we weren’t disappointed. Four ales on hand-pump, Wychwood Hobgoblin, Bloody Doombar, Everards Pumpkin and North Cotswold breweries Windrush. We sent a text to Pharp, advising him that one of his favourite tipples was on tap, he replied stating the he’d ‘gone to ground’. If he was trying to hide from someone he could only hope that he could contain his Windrush. Parker had a coffee whilst we had a couple of pints of Windrush. At 3.6% this amber ale was packed with flavour, and served in very good condition. It was malty, hoppy, slightly sweetish but very good. Good enough to have another, having said that, if the choice of ales had been a little bit more than just amber or darker; we may have tried something else. Still the Windrush was worth a second pint. Interesting sign on the toilet door, ‘Please don’t slam the door, children asleep in the room above’. A very quiet pub indeed, bring your books for a peaceful read. The lagers were better than the usual swill, with Peroni and Urquell Pilsner available, although lager drinkers might find that Urquell, a Pilsner, might have too much flavour for their sterile palates. Beware the car park at the rear of the pub, you have to pay to use it, although just £1 for 3 hours. That was it, onto tonight’s main event. The game, well it was actually quite entertaining, the prestigious competition had brought out all of 132 die hard footy fans who had forsaken the latest TV brain buster ‘Strictly Come Pot Making Bake Off’s Got Talent’. The Poppies had mostly kids on the park, with a few old farts making up the team raising the average age to 15, fortunately it was half-term so most of the players weren’t going to school the next morning. It ended 3-3 at full –time with the ‘Town’ winning the penalty shoot our 5-4, the Poppies kids were given a lolly pop and a fruit shoot to console them, the manager had to wipe their noses though, bless. The PRATS didn’t bother with a pint after the game, so straight home. Mrs Fuggles will be pleased.